How would you like FIOS speed while in the park? Some lucky folks who have Verizon LTE phones are enjoying just that. Verizon has confirmed faster LTE over AWS frequencies to PhoneScoop. Major markets LA & NYC have new Band 4 spectrum to play with. The new spectrum will help Verizon boost bandwidth and improve reliability. 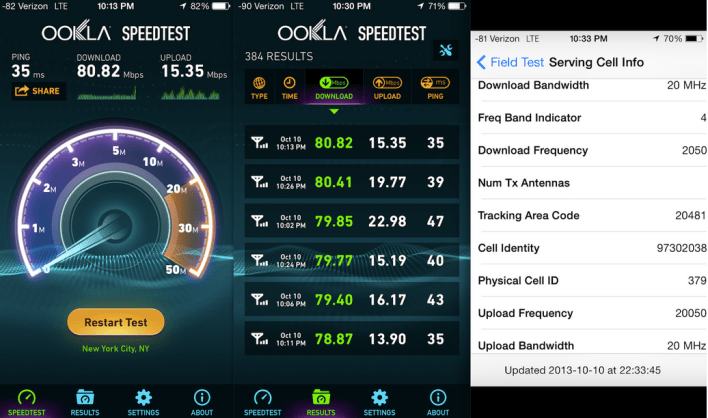 GigaOM reader Milan Milanovic has pulled down 80 Mbps on the new waves while in Midtown Manhattan, with uploads hovering around 15 Mbps. I look forward to Sprint and others to getting this speed in 2032. As our customers’ wireless data usage continues to grow, AWS spectrum is being deployed to ensure the continued consistent reliability and capacity of our 4G LTE network. Verizon Wireless has begun activating 4G LTE service on its AWS spectrum in many of our major markets across the US. A limited number of devices are AWS capable at this time. We plan to push a software upgrade to other AWS-capable devices in the near future.